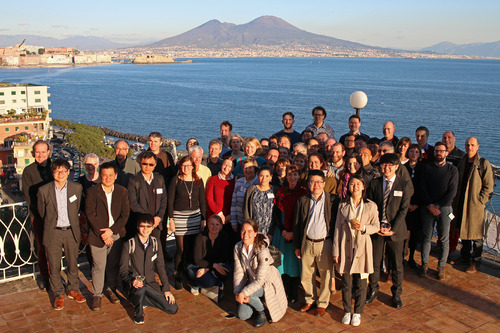 The fifth IMPRESSIONS General Assembly took place from 23 to 25 January 2018 at the Parthenope University of Naples in Italy, marking the long-awaited final stage of the project. Looking back at four years of building, testing and implementing frameworks, methods and models combined with extensive stakeholder engagement, IMPRESSIONS is now entering the last year of its lifetime. Through knowledge co-creation with decision-makers, IMPRESSIONS aims to improve understanding and assessment of potential impacts from high-end climate and socio-economic scenarios and the need for transformative solutions to reduce risks and vulnerabilities. The project has created pathways of adaptation and mitigation strategies for reducing vulnerability and moving towards a vision of a sustainable future. The pathways explore complex interactions across scales (global, European and regional) and sectors (agriculture, forestry, biodiversity, water, health, urban) in effectively adapting or mitigating potential impacts due to high-end climate and socio-economic change. Moving towards its finalisation, IMPRESSIONS is now providing an overview of the sensitivities of different sector models across Europe to changes in climate and socio-economic drivers. Additionally, the team is creating quantitative and qualitative comparisons and syntheses, regarding methods and results throughout the project. A special IMPRESSIONS issue in the journal Regional Environmental Change will feature key project methods, results and conclusions. The final results will be available within the exclusive IMPRESSIONS Information Hub in October 2018, right after the end of the project in a range of formats (videos, infographics, practitioner guides). A series of policy briefs will provide policy recommendations based on project results. A final stakeholder workshop will bring together key actors from all case studies. IMPRESSIONS will be part of the 2018 Adaptation Futures Conference with a number of sessions and a dedicated stand. A series of videos and infographics will introduce results and findings to a broader audience. The fifth and last General Assembly took place to gather the IMPRESSIONS team and gave participants the opportunity for a fruitful discussion about the project’s final steps.